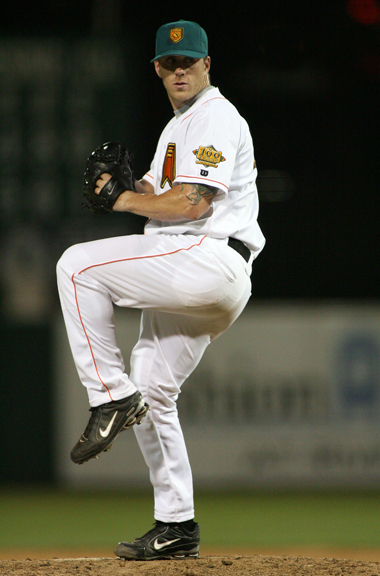 The 2011 season for the Fresno Grizzlies started with a complete turnover in the starting rotation from the 2010 season. With departures from pitchers like World Series Game 4 winner Madison Bumgarner and Grizzlies’ wins leader Eric Hacker, fans were not sure what to expect from the starting rotation this season. It was eventually decided that the ace for the Grizzlies would be journeyman Ryan Vogelsong. 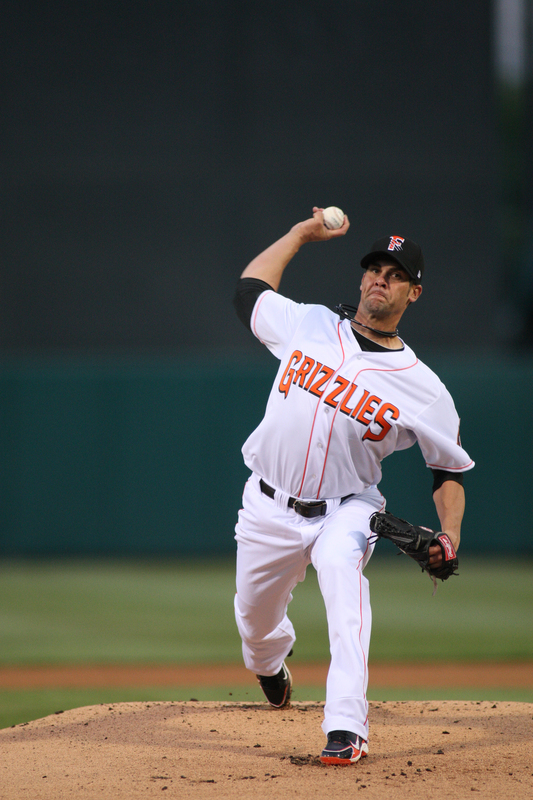 Vogelsong turned in an impressive start for the Grizzlies on Opening Day against the Las Vegas 51’s. The 12-year veteran tossed 5.2 innings of three hit ball, giving up only one earned run, striking out nine batters, earning the win in the process. His next start against the Tacoma Rainiers on April 12th was almost an identical performance. Once again, Vogelsong went 5.2 innings, gave up only one earned run, fanned eight batters, and earned his second consecutive win. It would be his last appearance in a Grizzlies uniform before being called up to the San Francisco Giants on April 17th. The North Carolina native was originally drafted by the Giants in the fifth round of the 1998 Major League Baseball Draft. Vogelsong eventually made his Major League debut with San Francisco on September 2, 2000, where he pitched a 1-2-3 inning of relief against the Chicago Cubs. 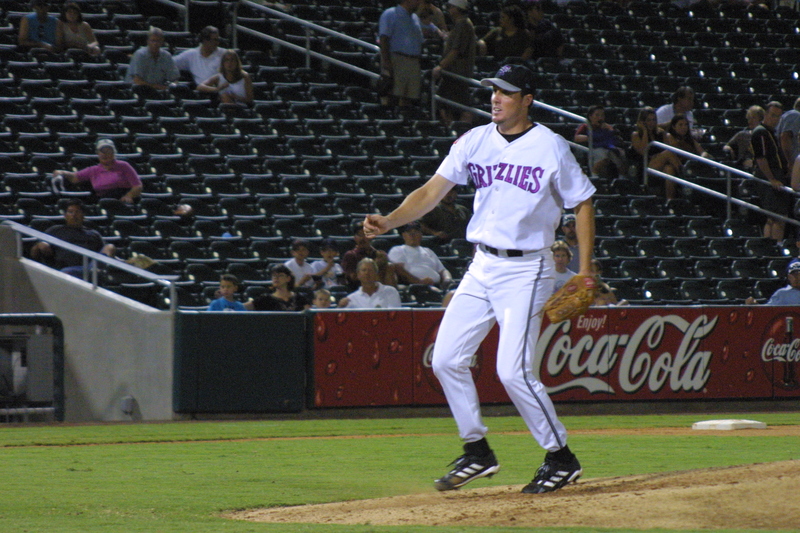 He was not able to earn a spot in the rotation though, and in 2001, was assigned to the minor leagues where he made his debut with the Fresno Grizzlies. His first start in Fresno was on Opening Day against the Iowa Cubs, where he pitched 6.0 innings of one hit ball in a no decision. Vogelsong was traded later that year to the Houston Astros organization, and traded once again to the Pittsburgh Pirates at season’s end. Vogelsong put together his longest Major League stint with the Pirates from the middle of the 2003 season through the middle of the 2006 season. During that stretch, Vogelsong compiled a lackluster 10-17 record with a 5.87 ERA. He was sent back down to AAA Indianapolis in 2006 and was released from the Pirates at the end of the season. His next three seasons would be spent in the Japanese League, pitching for the Hanshin Tigers and Orix Buffaloes. It was not until last season when he made his return to the states. He made 7 starts (25 appearances) with the Lehigh Valley IronPigs (PHI), compiling a 2-5 record with a 4.91 ERA. Later in the season, Vogelsong would return to the PCL, pitching for the Salt Lake Bees (LAA), going 1-3 with a 4.66 ERA in 7 starts (8 appearances). Considering the multitude of struggles and obstacles he has had to face throughout his career, Vogelsong is experiencing no such thing in 2011. During his time with the Giants this season, Vogelsong has been nothing short of dominant. One of his more notable starts was on April 14th at Chicago (NL), where he pitched six innings of shutout ball in what would turn out to be a complete game. The contest was called due to rain. He also turned in a 6.1 inning, one hit performance against Colorado on May 8th in a winning effort. As of this article, the tall right-hander is 3-0 with a 1.93 ERA with the Giants. Vogelsong has also not given up an earned run in 18.1 innings as of this article. He is, at least from a statistical standpoint, the best pitcher for the Giants so far this season on a star-studded pitching staff. Vogelsong will look to continue his remarkable start to the season on May 26th against the Florida Marlins at AT&T Park. Make sure to keep an eye on this veteran as the season progresses. Perhaps he is the next Grizzlies alumn to do big things at the Major League level. Who: Brian Wilson nicknamed “B-Weezy”, friend/neighbor of “The Machine“. When He Was a Grizzly: Wilson pitched on the Grizzlies for three years, where he made 64 closing appearances.
? Had a total of 80 strikeouts in 73.2 innings pitched.
? Logged an ERA of 2.10 in 2007 in 31 games.
? Tallied 18 total saves with the Grizzlies.
? Allowed only two home runs in 73.2 innings pitched over three seasons. Where He Went From Here: In 2006, Wilson made his Major League debut with the Giants on April 23rd, when he threw 2.0 scoreless innings against the Colorado Rockies at Coors Field. Where He is Now: 2010 marked Wilson’s fourth year in the majors. His fearless ball-throwing skills helped carry the Giants to their first World Series Championship since the franchise moved to San Francisco in ’58. Also, Wilson is the keeper of the 2010 World Series game-winning baseball, which he stores in a Halloween candy jar in his kitchen. He is the face of the “Fear the Beard” slogan and is known for his bright orange cleats, that he began sporting after the All-Star game in 2010.
? In 2008, Brian became one of three pitchers in Giants history to have 40 saves in a single season.
? Made the National League All-Star team for first time in 2008, then again in 2010.
? Between May 2nd and August 20th 2008, Wilson had 24 consecutive saves.
? Finished off the 2010 season with 93 strikeouts in 74.7 innings pitched and led the NL with 48 saves. When He Was a Grizzly: Joe played with Fresno for four seasons from 1999-2002. Despite his less than stellar numbers as a Grizzly, the San Francisco Giants 1995 sixth round went on to an All-Star career as a Major Leaguer.
? Throughout the four seasons with Fresno, Nathan compiled just a 12-23 record with a 5.59 ERA.
? The right-hander put up his best numbers with the Grizzlies in his first season, winning six games against four losses in 13 starts. He finished the 1999 season with a 4.46 ERA.
? Joe’s 2002 campaign with the club was also the first in which he saw time out of the bullpen. In 31 games, the Texas native made six relief appearances. 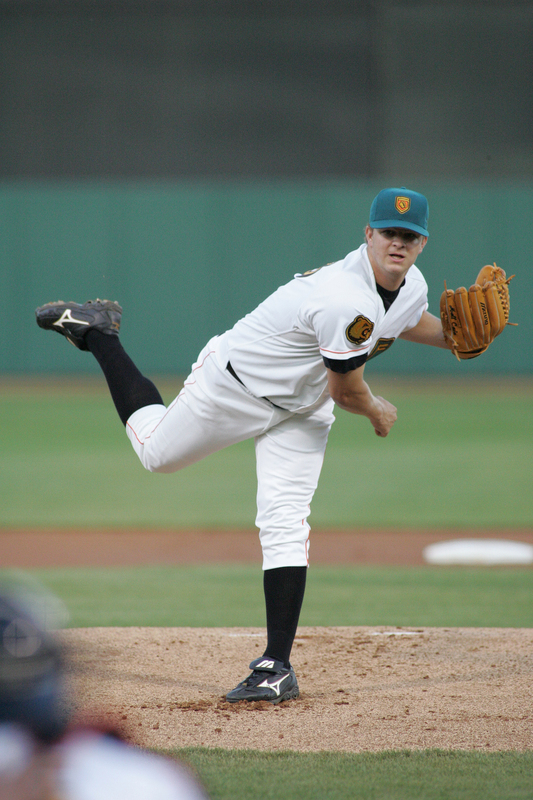 Where He Went From Here: After making his Major League debut with the Giants in 1999, Nathan saw time with the Grizzlies’ parent club in 2000 and 2002 before pitching the entire 2003 season in San Francisco. All 78 appearances with the Giants that year were out of the ‘pen, and he compiled a 12-4 record with a 2.96 ERA in 79.0 innings. Nathan was traded in mid-November of 2003, along with former Grizzly Boof Bonser and Francisco Liriano to the Minnesota Twins for catcher A.J. Pierzynski and cash. The right-handed reliever made his mark as one of baseballs top closers with the Twins since 2004, adding four All-Star appearances and two top-5 finishes in the AL Cy Young Award voting. In six seasons as a Twin, Nathan has gone 22-12-361 in 412 games, while yielding a minuscule 1.87 ERA.
? Set a Minnesota Twins single season record with 47 saves in 2009.
? Went 7-0 with a 1.58 ERA, and a 0.79 WHIP in 2006.
? Tallied a career high 95 strikeouts in 2006, averaging 12.5 K’s per nine innings.
? At the plate, Nathan accumulated five hits with the Giants in 2000, four of which were for extra bases. Two of the four extra base hits were his only two career home runs in the Majors. When He Was a Grizzly: Made 26 appearances, all starts, during the 2005 campaign. only season with the team.
? Won his last five decisions of the ’05 season, dating back to July 16th.
? Led the Fresno pitching staff by recording 10 of the team’s 68 wins.
? Recorded a season-high 11 punchouts in only 5.0 innings of work on July 28th, 2005. Where He Went From Here: Cain made his Major League debut at just 20 years of age on August 29, 2005 with the San Francisco Giants against the Colorado Rockies at AT&T Park. Where He is Now: 2010 marked Matt’s fifth full season with the San Francisco Giants after starting his big league career late in 2005.
? Pitched a complete game in only his third start with the Giants, yielding a single run on two hits while recording eight strikeouts in a win at home against the Chicago Cubs on September 9, 2005.
? Led San Francisco pitchers with 13 wins in his first full season in 2006.
? Earned a win in six straight starts and seven straight decisions from May 7-June 14, 2009.
? Was the longest-tenured Giant on the roster during the club’s 2010 Championship run.
? Did not allow an earned run in 21.1 innings over three postseason starts for the World Series Champion San Francisco Giants. 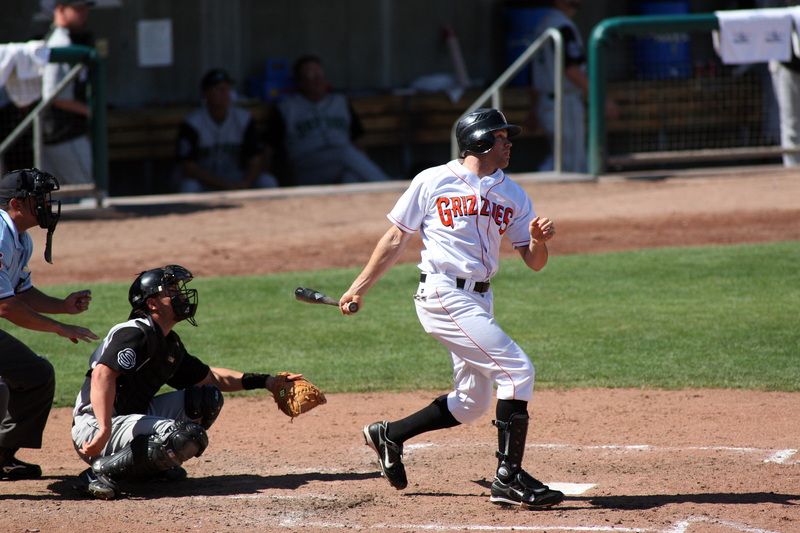 When He Was a Grizzly: Played in 202 games from 2007-2008, and five games on MLB Rehab in 2009. Was awarded PCL Player-of-the-Week honors for the week ending May 7, 2007. Tallied 10 triples over the course of the 2008 season – second most for a single season in Grizzlies franchise history. Where He Went From Here: After making his MLB debut on June 11, 2007, Schierholtz played parts of the 2007 and 2008 seasons with the Giants before making the Opening Day roster in 2009. Where He Is Now: Nate is currently finishing up his second full season with the Giants. Had a pinch-RBI single in the sixth inning of the September 28th game against the Diamondbacks, breaking a 2-2 tie en route to a 4-2 Giants win. Delivered a two-run triple in the top of the 11th inning on September 6, 2010 to propel the Giants to a 2-0 victory over the Arizona Diamondbacks. Participated on the United States Olympic Team during the 2008 Beijing Olympic Games. Hit an inside-the-park home run on June 14, 2009 – just the fourth in AT&T Park history.